I love sukiyaki. It’s one of my favorite Japanese dishes, and it’s rarely up to snuff when I order it out at a restaurant. However, it’s also incredibly easy to make at home. If you’re capable of chopping and boiling, you can make sukiyaki. The sauce ingredients for sukiyaki are all traditionally high amine (sake, soy sauce, etc), so here I’m using my low-amine soy sauce substitute, low-amine sesame oil substitute, and low-amine sake substitute. Sukiyaki can be done with meat or without. 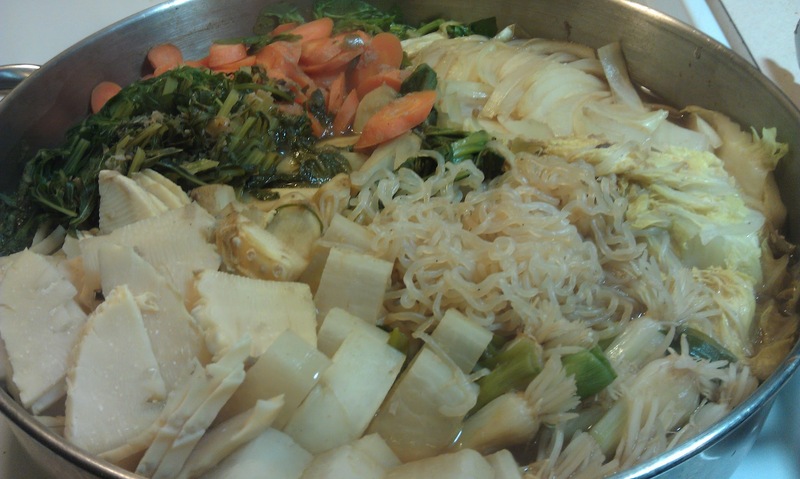 I’ll be dining with a vegan for this batch of sukiyaki, so you won’t see the meat. However, I will add the steps in italics for those who want a beef in their food. 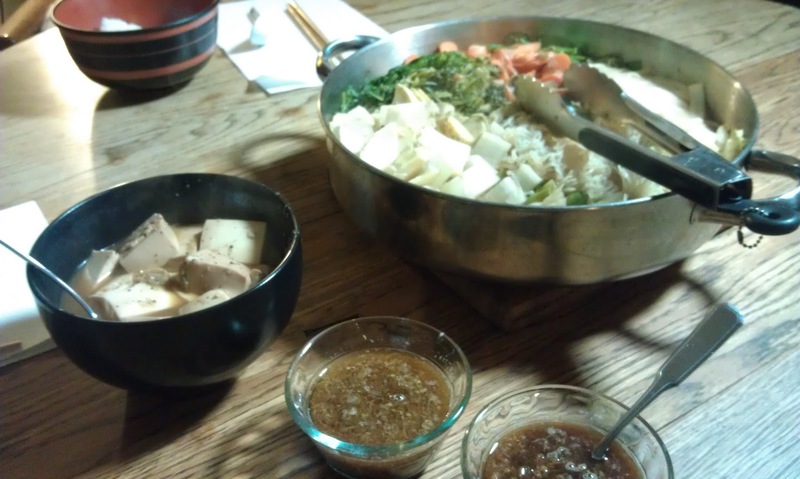 Traditionally, sukiyaki is served at the table and everyone takes food from the center of the table. The ingredients are dipped (based on the individual – some people love this, some people hate it, and for some it’s just an acquired taste) in a well-beaten egg, and eaten with a bowl of rice. You can also use a soy sauce/citrus (or soy sauce substitute and ascorbic acid) mix, or soy sauce (soy sauce substitute) with grated daikon radish and/or ginger for dipping. As this dish is served with a small bowl of rice, cook rice if desired. Chop greens into pieces about 2″ long. Chop onion into “C” shape. Cut burdock root and carrot fairly thinly (1/4″ thick or less) at an angle, so that they are in a sharp oval shape. Drain shirataki noodles and break them up. Use kitchen scissors to cut the noodles down a little bit (I just stick the scissor tips into the bowl of noodles and snip the noodles at random three or four times). Arrange all ingredients in a large, high-walled pan. In separate saucepan or small pot, combine all sauce ingredients together. Bring to a boil and reduce to a simmer. Simmer, covered, for 2 minutes. When sauce is done, turn on heat for vegetables on to medium. Pour all but a few tablespoons of the broth over the top of the vegetables. Cover. 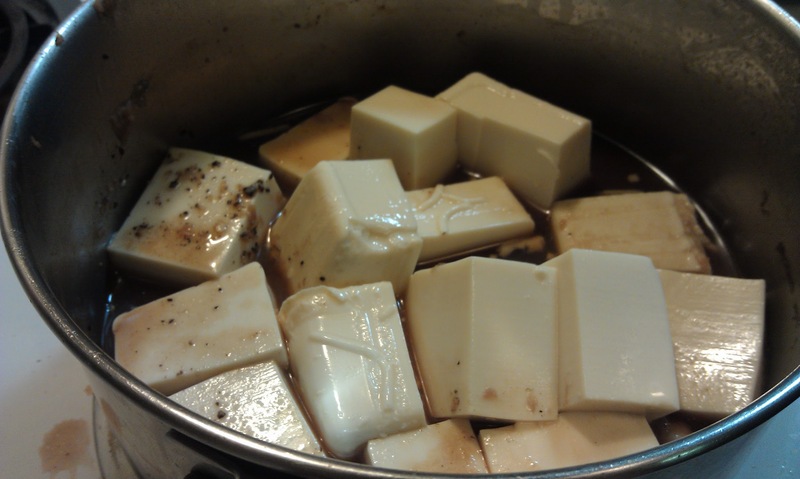 While vegetables are cooking, cut tofu into cubes about 1″ thick. Add cubes to remaining broth and set to medium low, covered. If you are cooking with tofu in the batch, rather than soy-free, place cubes on top of other vegetables where they won’t get crushed, as soft tofu is delicate. Halfway through cooking vegetables, once the vegetables have started compressing, push the harder to cook vegetables down to the bottom if they are near the top (such as gobo root, daikon, yellow onion, etc). Vegetables should cook for about 15 minutes, or until vegetables are done. In small ramekins, create your dipping sauce. I use one raw egg, beaten, with a dash of soy sauce substitute mixed in. I won’t say you’ll never get salmonella, but I will say that in all my years of frequently eating this dish, I’ve never gotten sick from the raw egg. That one is up to you. If cooking meat, turn skillet to high with 1 Tbsp oil. When hot, break apart meat into individual strips and add to pan. Toss around to ensure it cooks evenly, as it will cook very quickly. I like mine very rare, but cook as desired. 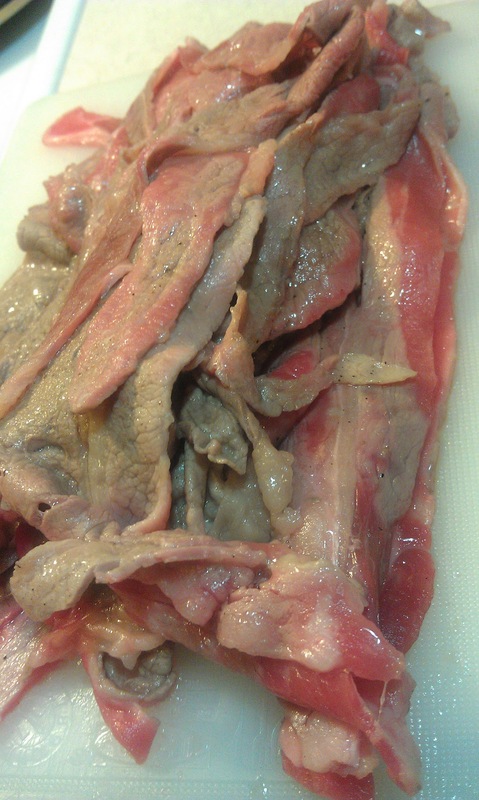 Keep meat separate from sukiyaki if you like it rare, or if you have vegetarians or vegans at the table. If not, put the beef in the sukiyaki with the rest of the sukiyaki ingredients. 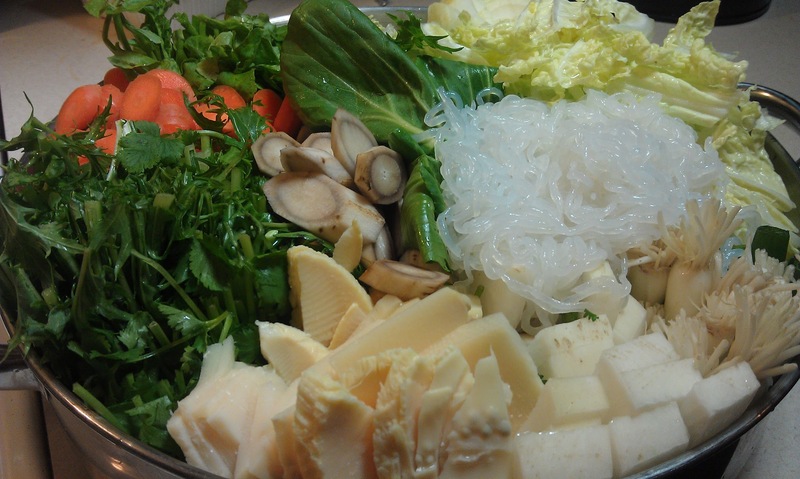 If there are no vegans or vegetarians, pour the meat cooking juice into the sukiyaki. Serve sukiyaki at the table with rice and dipping sauces/egg. Everyone picks ingredients they want out of the center dish and add a bit at a time to their bowl as they eat (it keeps the ingredients warm as you eat). No problem with soy, gluten, or amines? 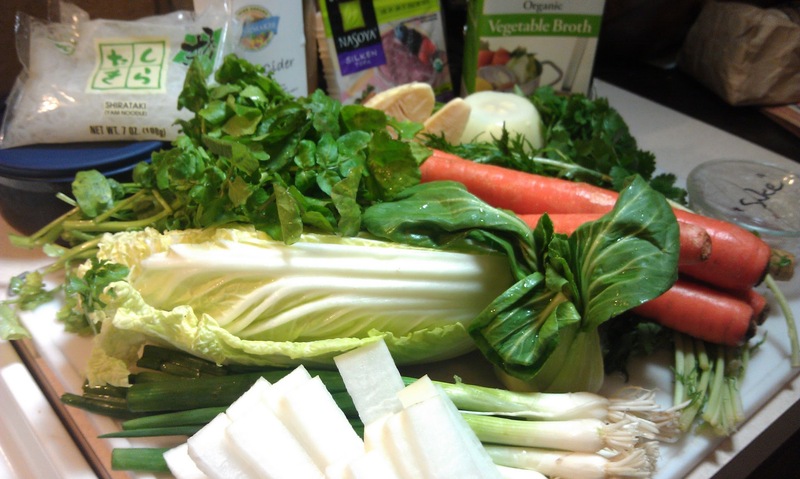 Make sukiyaki soup base the easy way.